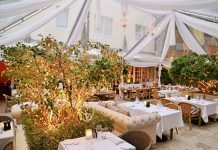 When you step into STK Miami Beach you’ll notice a few things. 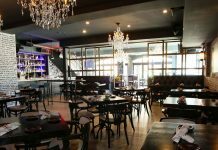 It’s dimly lit with a sleek bar and lavish furniture but what makes it unique is what it lacks. You won’t find any white table cloths or stuffy waiters in this steakhouse. What you will see is a well-placed booth with the resident DJ spinning the hottest tracks. 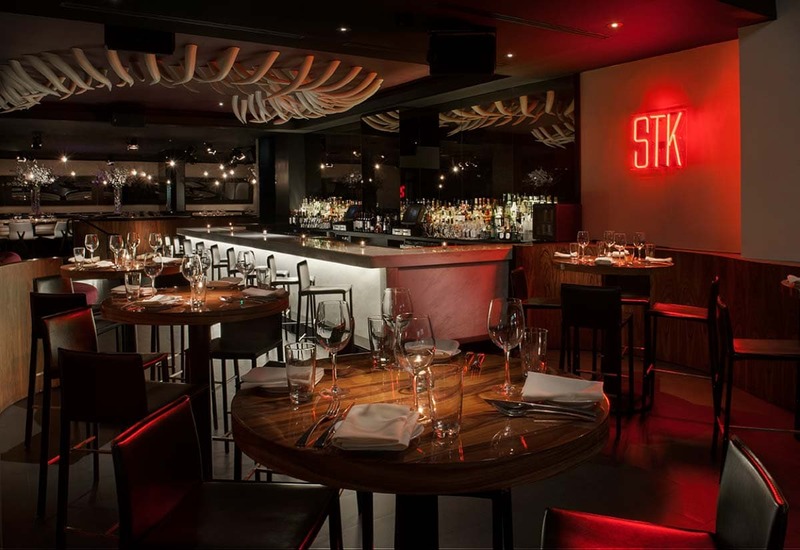 Plush leather seating and dinosaur bones on the ceiling give STK an edgy vibe. Breathe, grab a seat and be prepared to be blown away. STK is not your Daddy’s Steakhouse. Bread at restaurants can be underwhelming. How many of us have had dry, hard bread thrust at us only to find that the accompanying butter is cold and a pain to spread? Not at STK. Their bread is epic. This fresh out the oven bread comes covered in butter and has a side of chive oil for dipping. It’s the perfect combination of soft, warm, and chewy goodness. I literally had a tug of war with my tablemate about who would have the last piece. Unfortunately, the odds were not in my favor and I failed to prevail in the battle of the bread. I needed a drink asap! Our server recommended the Strawberry cobbler and I was thrilled that I got to start my dinner with some liquid dessert. The graham cracker rim gives you the same crumbly texture that you find in your grannies’ cobbler but with the perks of an amazing buzz. Lil’ Brgs made of Wagyu beef, Seared Sea scallops, Shaved Brussel Sprouts, and Burrata with Spring Peas all managed to be fit on the table and the feast continued. These appetizers were serious business and we had a hard time picking a favorite. The Seared Sea scallops and Burrata tied for the win. The heirloom tomato was perfectly ripe and really highlighted the creaminess of the burrata. While the scallops literally melted in our mouths. 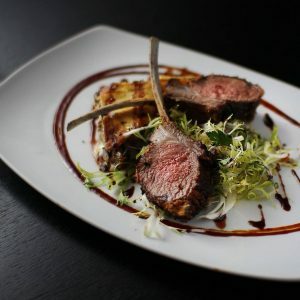 Since spring has officially arrived I felt inclined to try the Herb-Crusted Rack of Lamb. The lamb rested on a parsnip puree with beluga lentils topped with pickled cabbage and split jus. Perfectly seasoned and prepared, the lamb was an absolute pleasure to consume. The meat was succulent and we were sad when the last morsels had been pried from the bone. Alas, we had reached the end and nothing could have prepared us for the surprise that lay just underneath a mound of bright pink cotton candy. We were going to have our first encounter with #the cloud. At first, I was surprised. 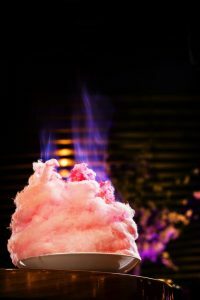 I always thought of cotton candy as fair food but the waiter soon changed my mind. He handily wielded a blow torch and obliterated the spun sugar revealing a deconstructed strawberry shortcake. The angel food cake is topped with strawberry ice cream and covered in white chocolate cream. I will never look at cotton candy the same. 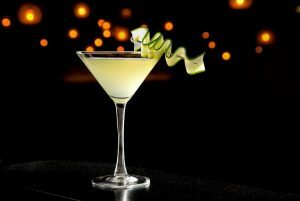 STK is great for a night out or happy hour. Their happy hour is weekdays 3:30-6pm, Thursday-Sunday 10pm-close. 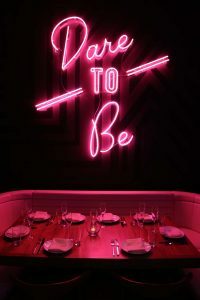 It features $2-$8 bites, 1/2 off cocktails, and $10 Justin Cabernet & Vievite Rose. Grab a drink, enjoy some sliders and make sure you experience #the cloud. The Aspiring Gentleman was hosted by STK. All opinions are my own.